This is a Coalescence of cutting edge technology and traditional/vintage looks. On the vintage side of things, we have a body shape based on the Jaguar along with Jaguar control plates and switching. 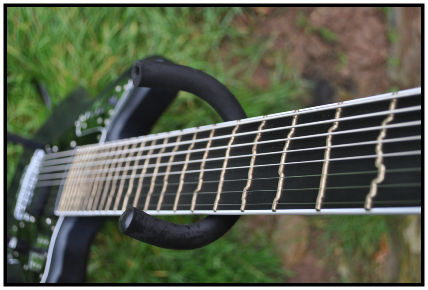 Then to take the design into the 21st century we have some advanced features such as an Evertune bridge, 26 True Temperament frets and of course 8 strings. 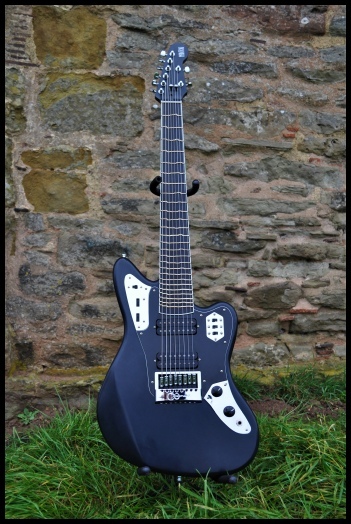 This makes it truly unique and I believe it is the first guitar to ever combine these interesting features in the Jaguar shape. The body is a single piece of Alder and features a slightly revised cutaway and body heel to allow access to all 26 frets. The neck is a 3 piece construction featuring a beautiful AAA grade Ebony fingerboard with 26 frets and binding. Both body and neck are finished in Satin black, adding a touch of menace to the appearance of the guitar. 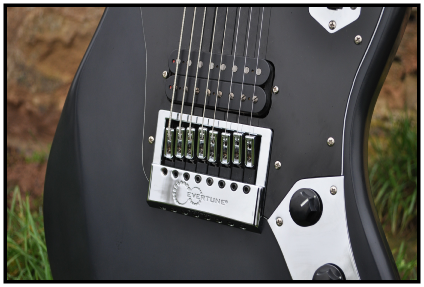 The combination of the Evertune bridge and True Temperament makes for a guitar that is always in tune no matter what the conditions…. An important feature for a touring musician. This guitar was commissioned by the Avant -garde metal band Lychgate (www.lychgate.net) who will be putting it to good use on their next album. This is their second True Temperament guitar built by Manton Customs. "It has been a pleasure to work with Manton Customs again - top service and expertise. This is the second True Temperament guitar they have produced [for us]. At first glance, yes, it is a modern answer to the Jaguar. It also happens to have spot on intonation, and thanks to the Evertune bridge, it *really* stays in tune. I am looking forward to using this for future recording sessions because it is definitely the most accurate guitar I have ever owned."